Keeping an accident checklist in the glove box and having access to a car accident app helps drivers and passengers eliminate guesswork during a potentially traumatic traffic incident involving injuries with another car, big rig truck, or bus. We advocate for the checklist so that you and your family can take every necessary step to protect yourselves physically and legally. Download the checklist on this page, print it and keep it in your vehicle with your registration. 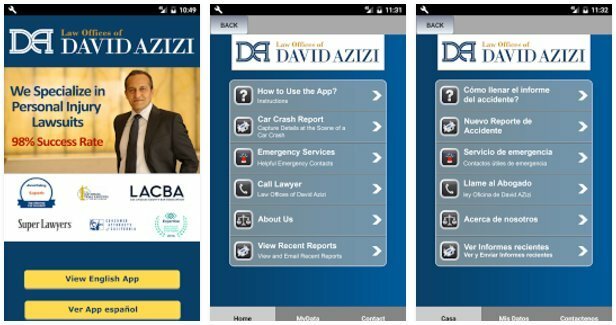 In addition, you can use the free auto accident app for your phone, so that no matter which vehicle you travel in, you’ll always be ready for the unexpected. At the scene of the collision, to retain evidence, it’s best to remain where you are and call 911. However, if a danger exists, you may need to direct your vehicle to the shoulder of the road out of harm’s way. Turn your emergency flashers on to warn approaching traffic. If you need to exit your car or truck, do so on the right side and stand well back from the vehicle. Check those in your vehicle for injuries, then check the other vehicle/vehicles involved if it poses no danger to you. Call for assistance from emergency personnel if needed. In California, it is necessary to contact police and report a collision if anyone is killed or injured in an accident or if vehicle damage is $1,000 or over. In California, you must stop if you are involved in an accident. If you don’t, you could pick up a hit and run charge. You must also offer assistance to anyone injured in the accident by dialing 911. Do not remove injured persons from a vehicle unless in circumstances where remaining would put their lives in greater danger, like if you see smoke or flames coming from the vehicle. If you hit a car that is parked and no one is in it, you still need to try to identify yourself. You can tie a note to the car to let the person know your name, address, and phone number. Once you arrive at home, you should notify the police or California Highway Patrol depending where the accident happened. If an animal is injured, do not physically try to remove it from the roadway. Call the humane society or the police and tell them what happened. If the animal is injured but still alive, relay the urgency of the situation urgent. Do not leave a hurt animal to die. Exchange information with the other driver. Include name, phone number, the license number of the vehicle and insurance information. Do not supply coverage information. Afterward, talk to witnesses, and get names and phone numbers. Do not admit fault for the accident. It is important to document damage to your vehicle as well as other vehicles. The easiest way to do this is to take pictures with your cell phone. Make sure to take pictures of both cars and any skid marks or debris on the roadway. If you don’t have a cell phone, be sure to write it all down. Call your attorney and your insurance company to tell them about the accident. 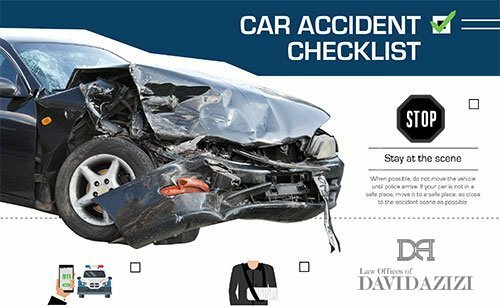 Your attorney will probably give you additional advice on what to do and can go over additional essential steps after a car accident to protect yourself legally and to prepare you for a potential lawsuit. Follow police instructions when they arrive. They are there not only to investigate the accident but to ensure your safety. When police are called, they will also prepare a police report and will most likely give you a copy. If not, you can request one through the police department.